I have really been enjoying Pinterest! 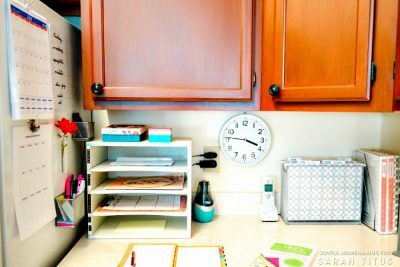 There are just so many great ideas for decorating and organizing, cleaning and recipes… This past week I found some good ideas for how to organize some of the smaller things around my house, and many of them came from The Family Handyman which has awesome ideas! 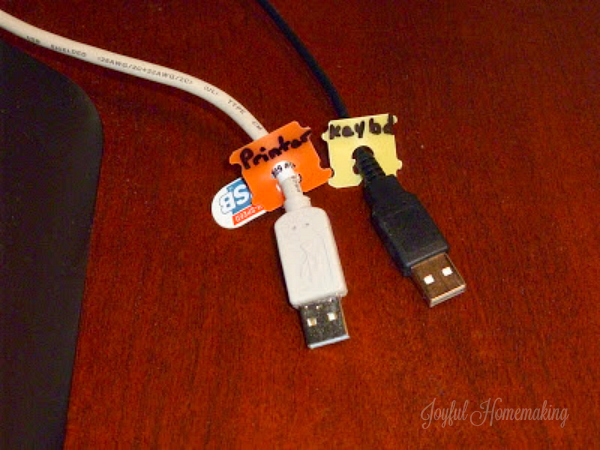 One of the ideas was to use bread clips to label cords. I have several appliances close together on my counter so this helps me know quickly which one I am plugging in. 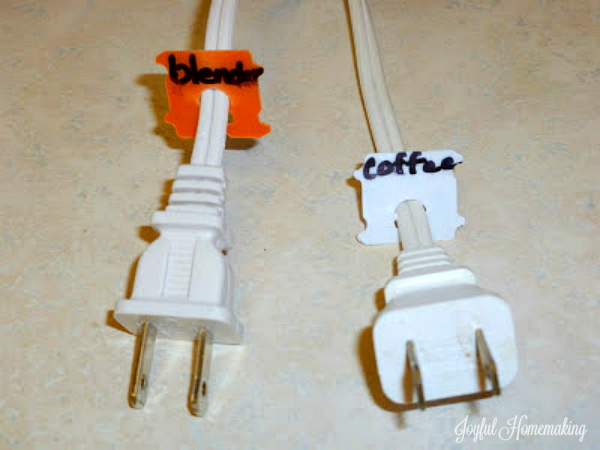 I try not to keep things plugged in that I am not using because my mother and father had a house fire a few years ago when they weren’t home from a blender that was plugged in and defective. 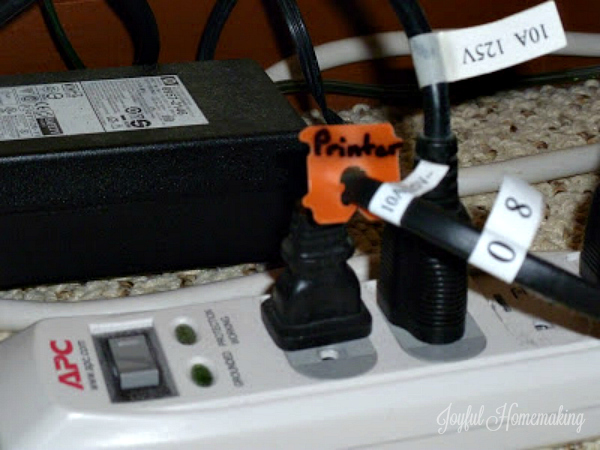 They also can work to label other cords like all those computer cords. Just be careful not to puncture your cords! 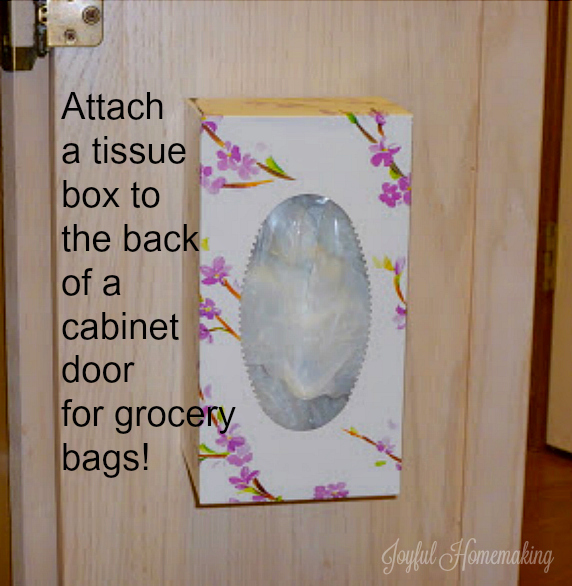 This was a clever idea also, to attach an empty tissue box to a cabinet door with thumbtacks, and then store your empty grocery bags inside for when you need them ( I actually used velcro to attach mine to the door). Even though I don’t have a lot of ribbon at the moment, I thought this was a great way to store spools of ribbon. 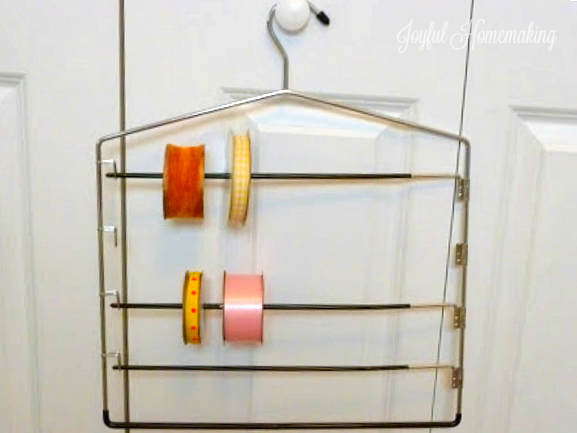 Just use a pants hanger that has the lift up bars to slide your ribbon on. Mine was missing a rung, but that might work well for larger spools! 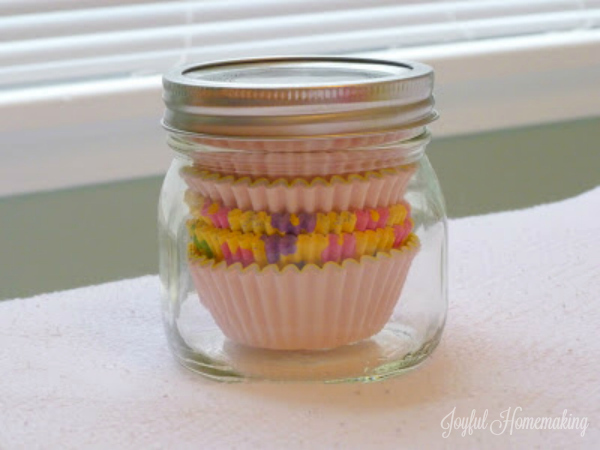 I really liked the idea of storing cupcake liners in a pretty glass jar. A taller jar would be pretty, but I had this short one on hand. You will need a jar with a wide mouth to get the liners to fit inside. Last week I organized this cabinet, and then I saw another terrific idea on using a tension rod in the back of the cabinet for those itty bitty spices and seasonings so they don’t get hidden behind the larger ones. I hope these tips are helpful; I know I was excited to share my recent Pinterest finds with you! Sometimes the littlest things can be a huge help! 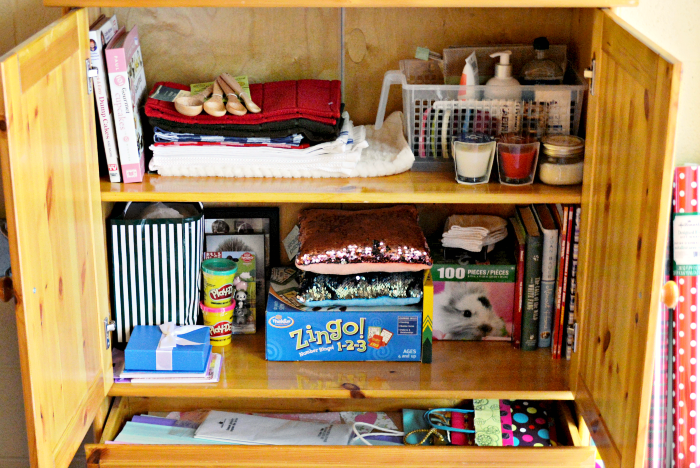 For more organizing tips, be sure to check out my Organization Archives! I love your organisational pins. I had pinned the same idea about putting the cake papers in a jar too! I have posted about some of my favourite Christmas wreath pins on my Christmas blog and I have also posted about a few of my favourite Halloween pins on my main blog so if you have 5 Minutes to spare please pop by! I would also be honoured if you could link up your post to my weekly Pinning and Singing Pinterest Linky Party as this post is Pinspirational! I am in love with Pinterest too! I really like the cupcake wrapper storage idea! Stopping by from TT&J. Pinned your bread tag label idea — BRILLIANT! Margo, what neat ideas and tips! Thanks for sharing! 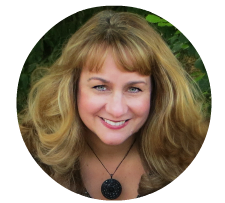 I am now your newest follower via the creation corner blog hop. I hope you will follow me, too! Many blessings to you! I love the cupcake paper and bitty spice container organizers. Great ideas for sure!! Found your link at Funky Junk and love so many of the ideas you discovered on Pinterest! I have just started over there and now see why it’s so addicting! Now I need to go look for some jars for my cupcake papers! There are some GREAT ideas here, thanks for sharing! Thank you for sharing — I especially love the bread clip idea. 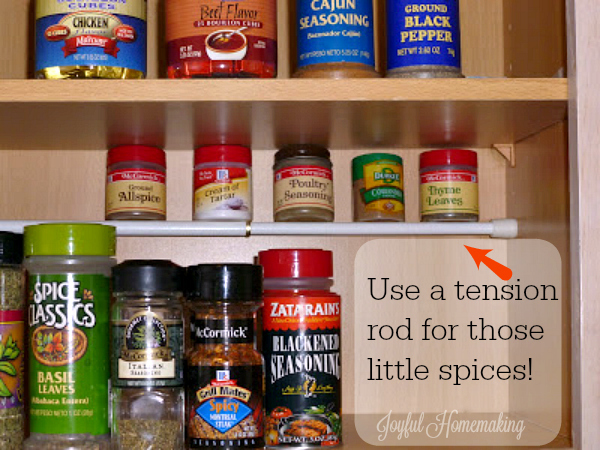 I love the idea for the small jars of spices to go on the tension rod. Fantastic! Thanks for sharing these great ideas! Thanks for sharing! I love the cupcake-liners-in-a-jar idea! Great job putting ideas into action! i don’t know of anything that isn’t better in a little screw top jar. Super cute. Great job! I love little tips like these – and am totally addicted to pinterest – so many great ideas! Great tips…Pinterest is a God send! 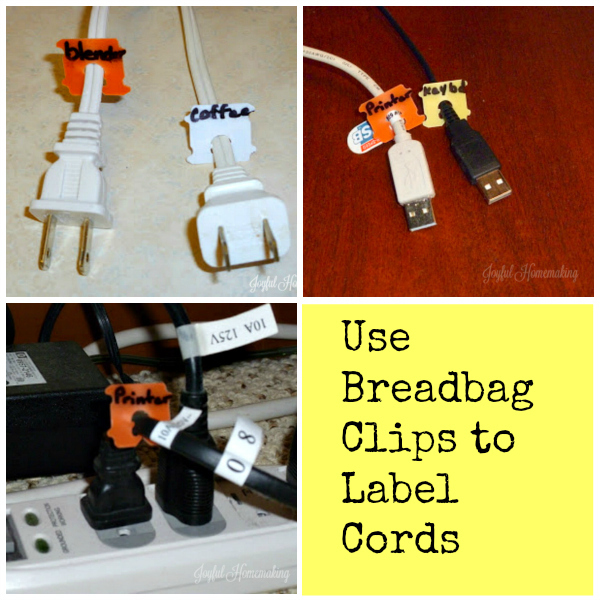 Great tip about the bread things for electric cords. I wrapped paper notes around my Dad’s cords so he could keep up with them. I love the cupcake wrapper idea. I used a small jelly jar with a regular lid. It works well – only one liner comes out at a time since it is a tight fit. Can’t wait until my kleenex box is empty to organize my plastic bags. 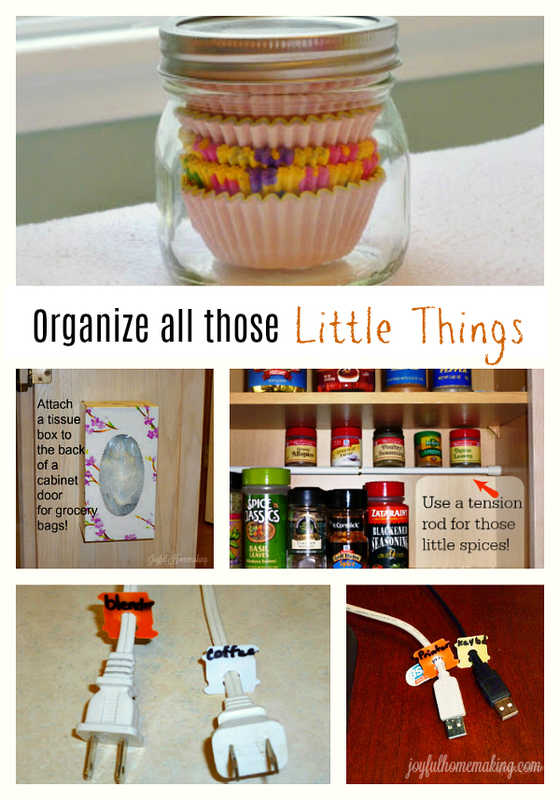 I love these ideas, I must find a jar for the cupcake papers. 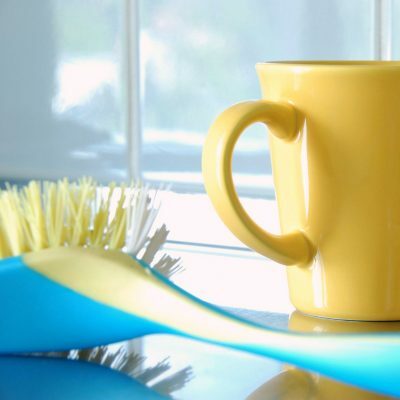 I am always looking for ways to be potter organize my house. That’s a genius idea for the tension rod. I will defifnitely be getting a couple for my cupboards as I have no idea what’s hiding at the back!